At the Syntax distillery, we have a passion for producing our award-winning, small-batch spirits from grain-to-glass, using local, raw ingredients and pure Colorado whitewater. Located in historic downtown Greeley, Colorado, Syntax has been making fine whisky, vodka, rum, and specialty spirits since 2010. All Syntax Precision Spirits products are handmade from scratch. We never take shortcuts and never use alcohol produced anywhere else, by anyone else. We also use sustainable production practices, such as minimizing water use, recycling bottles and packaging, and giving our spent grain to local farmers. See our events schedule for parties, releases, and cocktail making and distilling classes taught by owner and distiller Heather Bean. Look for our products at liquor stores, bars, and restaurants in Colorado and Wyoming! Syntax’s Straight Bourbon Whiskey is a Colorado craft bourbon made grain-to-glass from local corn, wheat, barley, and pure Poudre River whitewater. Each batch is barrel aged for at least two years in full-size 53 gallon whisky barrels, to produce a richer, more flavorful spirit than rapid-aging in small barrels. Our Bourbon was created to be sipped straight, as distiller Heather likes to drink her spirits… but try it with a single ice cube to open up the flavors. There’s no need to stop there, though – enjoy it in spirit-forward cocktails like a Manhattan, Whisky Sour, or Mint Julep. We make vodka the hard way — from grain to glass — never using any neutral grain spirits (NGS). When you drink Syntax’s Crystal Vodka, you’re enjoying a completely unique, truly local spirit that doesn’t taste like all the rest. To create its unique, smooth character, we start with 100% local wheat. Then we grind, mash, and ferment the grain, and distill it in our handmade column stills. Finally, we polish the flavor by carbon filtering. 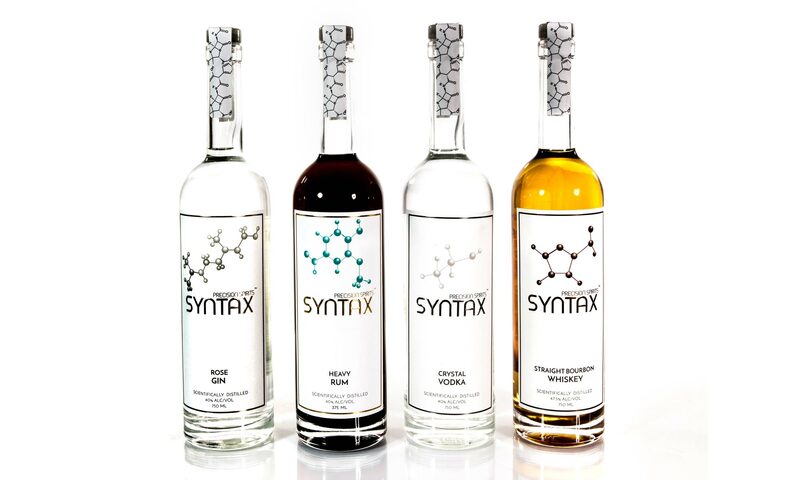 Syntax’s vodka has been awarded many honors including: Gold Medals from the Beverage Tasting Institute and Microliquor International Spirits Awards, and a Finalist rating in the Good Food Awards. Try it mixed, on the rocks with a twist, or how owner and head distiller Heather likes it — neat. Syntax’s Rose Gin is a flirty floral gin that begins life much like our grain-to-glass Crystal Vodka. It’s then flavored with all-natural botanicals both in the still and in a vapor basket above the still column. Botanicals include juniper berries (of course) with red rose petals, sweet orange peel, lemon and lime zest, lavender flowers, anjelica root, cardamom seeds, liquorice root, coriander seeds, and Indonesian cinnamon. Mix it in all of your favorite gin drinks, from martinis to a tall, cold Tom Collins. It’s also fun to cook with, think gin-citrus shrimp on the grill for a fantastic summer meal! Each batch of our Heavy Rum starts with 100% American dark cane molasses blended with Rocky Mountain whitewater. Then we ferment it and distill it in our handmade column stills for a clean, smooth, sugary flavor. Next we age it in a whiskey barrel and add just a kiss of the same dark molasses it’s fermented from for a rich, smooth flavor and texture and delightfully dark color. Our Heavy Rum is smooth enough for sipping straight or on the rocks, with flavors of rich vanilla, nougat, meringue, smooth caramel, malt, sweet cereal, and brown sugar. It also mixes gorgeously and is equally at home in a dark mojito or hot buttered rum. The unaged version of our Heavy Rum — Powder White Rum — has received several honors including a Good Food Award, a Silver Medal from the MicroLiquor International Spirits Awards, and a Bronze Medal from the Beverage Tasting Institute. In chemistry, an alcohol is any organic compound in which the hydroxyl functional group (–OH) is bound to a saturated carbon atom. The generic term alcohol generally refers to the primary alcohol ethanol (ethyl alcohol), the predominant alcohol in alcoholic beverages. Being good geeks, we’re proud to say that yes, the molecules featured on our bottles are indeed real molecules, and each one of them lends its unique character to the spirit that it’s featured on. Read on to learn more! Furfural is the molecule featured on Syntax Straight Bourbon. Its chemical formula is C5H4O2 and it’s an aldehyde that originates from the barrels that the whiskey is matured in. It’s naturally reddish-brown and has an almond-like, grainy flavor. Its name is derived from the Latin word furfur, which means bran. Ethanol is the molecule shown on Syntax Crystal Vodka. Vodka is nearly pure ethanol, or C2H5OH for our fellow chemistry geeks. The molecule also happens to be shaped like a dog, which is apt considering that many think of it as one of man’s (and lady’s) best friends. Geraniol is the molecule that graces our Rose Gin. It’s a terpene alcohol with the chemical formula C10H17OH and has an aroma that most describe as rose- or geranium-like. It’s found in many floral oils, but most notably in rose petals, which feature prominently in our Rose Gin. Vanillin is the molecule displayed on our Heavy Rum bottle. Vanillin is a phenolic aldehyde with the chemical formula C8H8O3 and is produced from the lignin in wood when barrels are charred. As you might expect, it has a vanilla flavor and aroma that it adds to barrel aged spirits, like our Heavy Rum. Did you know that Greeley, Colorado where the Syntax distillery is located was voted as having the best water in the country by the American Water Works Association in 2017? In addition to winning the “Best of the Best” water award, Greeley water also won the People’s choice award at the same event. No other city has won both since the contest started 13 years ago. Did you know that the word “Alcohol” is derived from the Arabic language? Did you know that Syntax has an all-female production staff with advanced degrees in STEM fields? Owner and head distiller Heather Bean is a Mechanical/Chemical/Software engineer who graduated from high school at age 14, and we’ve had several production assistants that are female and degreed in science. In fact, much unlike most craft distilleries, 90% of our staff is typically female. Did you know that methylphobia is what you have if you’re afraid of alcohol?